Long straddle=long a call and long a put with the same strike price. Long strangle =long a call and long a put with different strike price. Trade can be executed as a simple options trade. An investor would go long a straddle / strangle in the hope that the underlying will move a long way from strike. A long straddle can be delta-hedged regularly, if investor expects high volatility around the strike (where there is most gamma). Such delta hedging locks in gains. Investors will go long when expect the underlying to move significantly, but are unsure as to which direction. The position would also profit from a rise in implied volatility. Short when one expects an underlying to finish at a certain price. Investors will go long a strangle when they want to enter the position at a reduced cost, and they expect the underlying price to move very significantly. Investors will go short a strangle when they believe that implieds are overpriced, and they expect an underlying to remain range-bound. Shorting a strangle can be regarded as less risky than sorting a straddle. 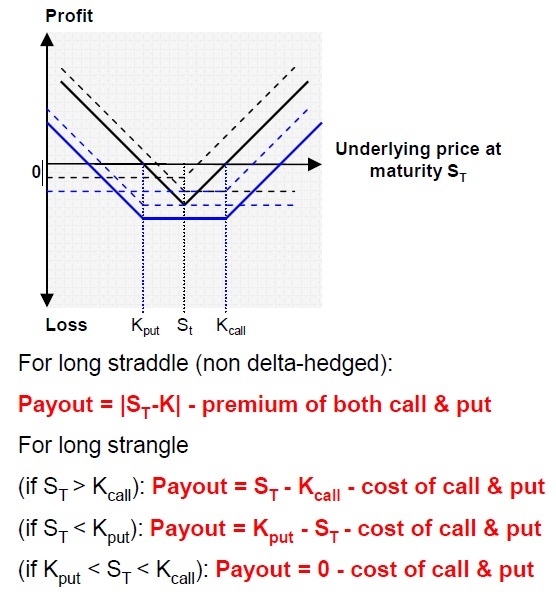 Both straddles and strangles can be used with delta hedging when an investor expects high volatility around the strike price (where gamma and returns from delta-hedging will be greatest). Simplest way of taking a view on volatility. Loss limited to cost of the options while gain is potentially unlimited. Strangles are less risky to write, and cheaper to buy than straddles (as both call and put are out of money), although returns are lower. Tonight’s show saw Jillian meeting with a lady named Debra whose starting weight is 239.
is this figure correct? shouldn’t the straddle bear a greater loss than the strangle if the strike price remain unchanged.